Welcome to St. Andrew’s Episcopal School! Whether you are visiting our school website for the first time as a prospective parent, an alumnus looking to re-engage with the school, or a current parent looking for the latest news, I hope that you find this site informative and helpful. As is customary for a new Head, I will spend this year getting to know St. Andrew’s Episcopal School’s culture and customs, people and practices. I feel honored to have been selected, and I look forward to beginning our work together. As I walk through the campus and look at the landscape with everything green, healthy and vibrant it reminds me that St. Andrew’s is a healthy community with a positive outlook moving forward. I am excited about promoting the St. Andrew’s ten Core Values that has an emphasis on character development, and the formation of the boys and girls in our school community. Additionally, these Values are supported in our curriculum where the teachers work hand-in-hand with our students in providing knowledge, creativity, and autonomy. We gather several times weekly in our church to begin our day as a school community. 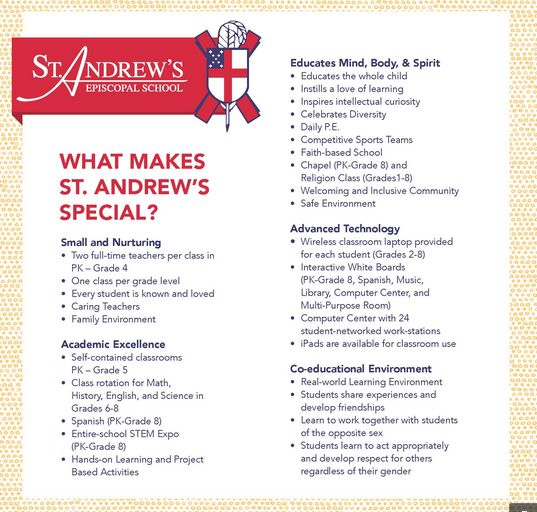 In the Episcopal educational tradition, St. Andrew’s is committed to high academic standards through a strong and robust curriculum. We look forward to your visit to our school and the opportunity to show you our academic program in action. We take great pride in engaging our students and providing many opportunities for critical thinking while simultaneously observing their journey in becoming the young leaders of today. We are committed to having our students reach their full potential every day. We would love for you to join us on this exciting journey. Kathryn Fitzpatrick was appointed Intermin Head of St. Andrew’s Episcopal School in the summer of 2018 and named Head of School in March 2019. Prior to coming to St. Andrew’s Mrs. Fitzpatrick served as the Director of Admissions at Stuart Hall School in New Orleans. Her eighteen years of education experience include teaching positions at Stuart Hall and St. George’s Episcopal School. Mrs. Fitzpatrick holds a B.A. from Louisiana State University, a Master of Education in Curriculum and Instruction from the University of New Orleans, and she is currently working on her Doctor of Education with a concentration in Executive Leadership at Our Lady of Holy Cross College. Mrs. Fitzpatrick and her husband Billy have three sons, Will, Sean, and Neal.